Pretty Luxury Art Case Upright Piano by Baldwin with beautiful hand painted pastoral European nature and love scenes on “patine” green. Made in 1955 restored 2017. Elegant, fine looking and playing instrument. Warranty. Questions? Call Sonny 631 475-8046. Steinway M 5’7″ from the Golden Age of Steinway Manufacturing. Rebuilt/restored 1992, case refinished, brand new Steinway Hammers, new pinblock, new soundboard, new strings, new dampers, repainted plate, beautiful set original keys. Very little playing time since rebuild. Rich, sublime, full spectrum tonal quality. Our furniture people just gave it a “French Polish” and our technicians just regulated and voiced the action. New Steinway M about $80k. Warranty. Sell Your Steinway! Get Top Dollar & Next Day Cash By Selling Your Steinway to Sonny! 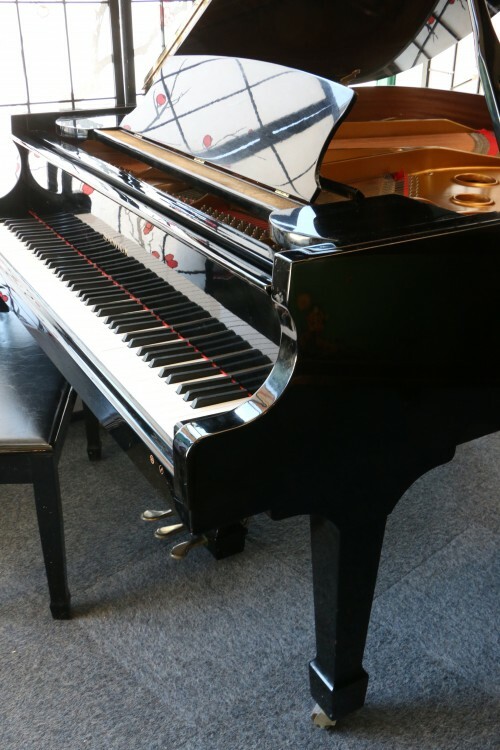 We purchase used, pre-owned Steinway Baby Grand & Grand Pianos. Any age, any condition any USA location. Visit our website http://sonnyspianotv.com/sell-your-piano to see our video for selling your piano. Call or e-mail us with the serial number and some photos and your contact information. If we can negotiate a mutually agreeable price then we will purchase immediately. We don’t waste your time by taking your piano on consignments or try and wholesale it out of your home. Why wait? Get cash today. 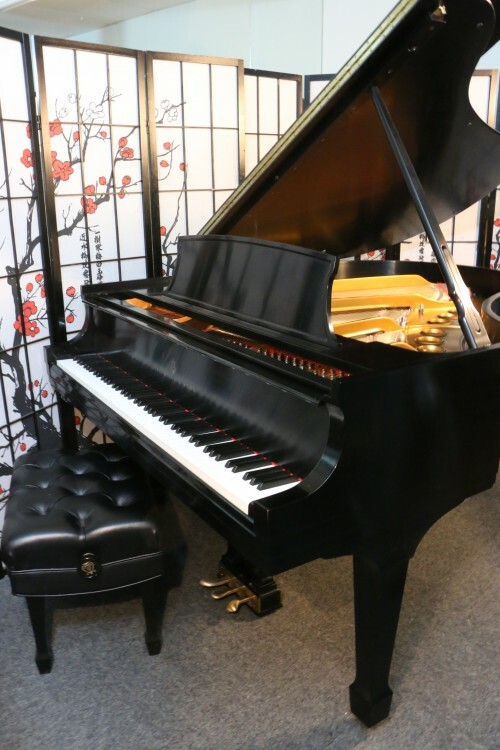 We pay immediately for pre-owned Steinway & Mason & Hamlin used baby grand and grand pianos with straight spade legs or art case decorative pianos with french provincial legs or cabriolet legs or Louie XV Legs in any condition. We handle all moving expenses. A historic, hand painted Steinway was recently unearthed in Connecticut and restored on Long Island. 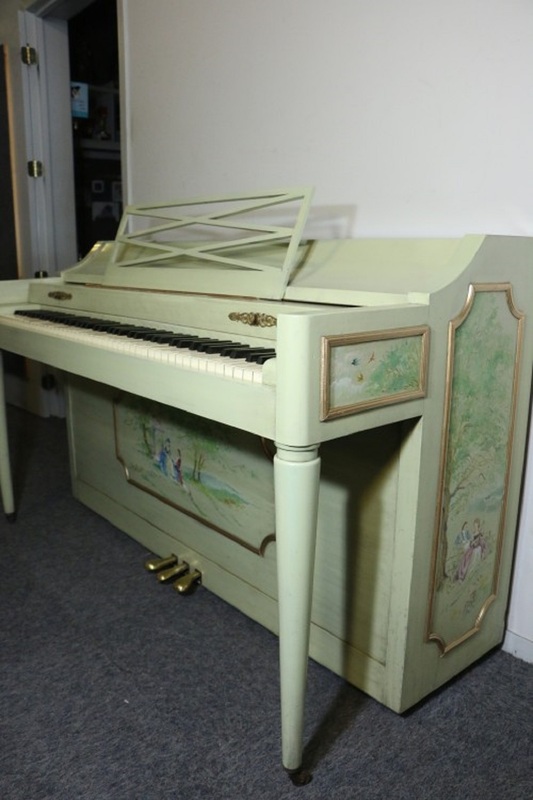 This unique piano is available for viewing and purchase at Sonny’s Luxury Art Case Pianos, Patchogue, NY. Nicknamed “A Prussian Prince’s Love Piano,” the Steinway grand piano was built in 1900 by craftsmen at the Steinway factory in Hamburg, Germany. The piano is believed to been sold to a Prussian Prince living in La Tour de Peliz, Switzerland. As if straight out of a fairy tale, the Prince apparently commissioned a master artist to immortalize his love for his princess through a series of “Vernis Martin” style pastoral love scenes painted on the piano. Sonny Stancarone, owner of Sonny’s Luxury Art Case Pianos, says “this is a one-of-a-kind masterpiece, a rare combination of art, sublime instrument and romantic history. There’s none other that I know of with all these elements combined into one piano.” To see more photos click PHOTOS. Sonny’s Pianos, located in Patchogue, New York, is one of the premiere restoration houses for pre-owned Steinways. Sonny’s buys, restores, and sells art case Steinways to a worldwide market through his innovative, interactive all video website. See WEBSITE. When it was sold to Sonny’s in the spring of 2015, the previous owner described its fascinating past. The owner’s grandmother had purchased the piano at Sotheby’s London Auction House in the 1920’s from the estate of a prince. The piano remained in England until 1960 when it was shipped to her daughter in New York City as a wedding gift. In 1995, the daughter gave the piano to her son and he kept it in his home in Connecticut until it was sold to Sonny’s Pianos. When Sonny purchased this piano in 2015, the years had taken their toll on the instrument and the artwork. Sonny’s team of expert technicians went to work and rebuilt the piano using the highest quality materials and parts available. A team of two artists completed the restoration of the paintings.The complete restoration took one year. Sonny and his staff spent several months researching and analyzing any information they could get about the piano. They contacted Steinway and Sons regarding the pedigree of the piano. Steinway records indicated that the piano was made in their Hamburg, Germany factory in 1900 and that it was sold to a buyer in La Tour de Peilz, Switzerland. A European art history consultant and member of the Appraiser’s Association of America was hired to evaluate the piano artwork. Her research revealed that La Tour de Peilz was a holiday resort frequented by Prussian royalty. The La Tour de Peilz historical society confirmed that the king and queen of Prussia had a very large estate in that area around the same time. The Nestle Corporation now owns the estate. Sonny’s team also discovered that two Prussian Princes were known to be affiliated with Tour-de Peliz during that time period.. One retiring and living out his life there with his wife after the fall of the royal house of Hohenzollern after WW1. The art consultant concluded that each scene represented a different love subject. The central theme for the Love Piano is the painting on the lid, a man and woman in a loving embrace. The man wears a crown of garlands on his head, perhaps representing royalty. The woman has red hair and fair skin representative of a person from that region of the world. The consultant determined that the paintings were “Vernis Martin” style, an 18th century technique named for the Martin brothers of Paris, who were instrumental in the development and refinement of lacquer in the style of Asian art. This style was the epitome of luxury and refinement made popular during the period of Louis XV, but ended after the French Revolution. During the mid 19th century, the trend revived and lasted until the 1920s. The piano is a Steinway model “A” grand piano, also known as a Hamburg A. 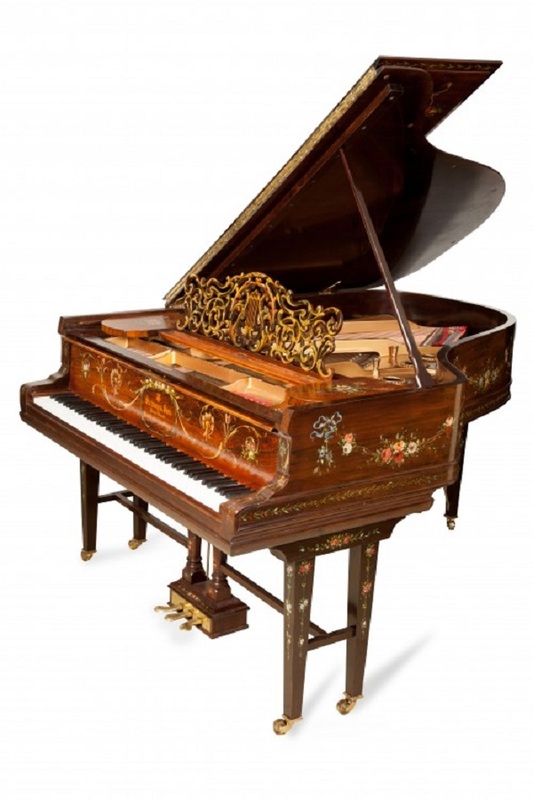 It measures six feet and has long been considered to be one of the most expensive and desirable piano models in the world, even to this day. Sonny christened the piano, “A Prussian Prince’s Love Piano” in honor of the love themes surrounding the instrument and all the other information that was discovered regarding the piano. Sonny is certain that this beautiful work of art and incredible musical instrument will be purchased by someone as a gift for a loved one, thus adding to the legend of the prince’s love piano. The piano has already started to make a buzz in the media world as Fox 5, Newsday, LIBN, Verizon Fios1 recently covered the story. Click PRESS for the news coverage and click VIDEO for a video tour of the Prince’s Love Piano. The price? Sonny says “since this is a one in a million masterpiece we feel that one million dollars is a fair price. Also other rare Steinways have sold in that price range and there are others that are out there now that cost even more.” And he says he is donating 10% of the final sale price to the Juvenile Diabetes Research Fund, Long Island Chapter to help find the cure for Type 1 Diabetes. Sonny’s passion for pianos and in particular art case pianos goes back to his childhood when he became enamored with his fathers decorative German upright piano and his uncle’s Steinway grand piano. Sonny first started playing the piano at seven years old when his father, a professional pianist, gave him lessons. His warehouse is stocked with a wide assortment of other beautiful art case pianos that he has restored. He calls it, “Sonny’s Luxury Art Case Pianos Collection.” To see other beautiful art case pianos available at Sonny’s, click ART CASE PIANOS. 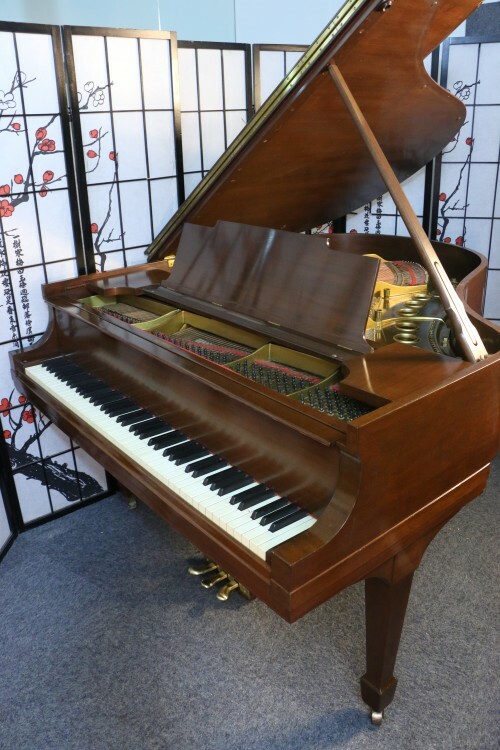 Art Case Steinway Piano Crown Jewel Model L 5’10.5″, very rare exotic wood “Macassar Ebony”. They don’t make the “Crown Jewel” series anymore. This piano would cost $150,000 to have custom made by Steinway & Sons today. In China and most everywhere outside of the USA it would be almost impossible to find a Crown Jewel Ebony Macassar Steinway, the price would easily be over 200,000 for a new one. Excellent, showroom condition inside and out. Action just regulated to world class concert stage performance level. Absolutely stunning to look at and also has rich, sublime tonal quality. Perfect candidate for a PianoDisc IQ Player System installation. Here’s what Steinway says about this piano and their Crown Jewel Series. 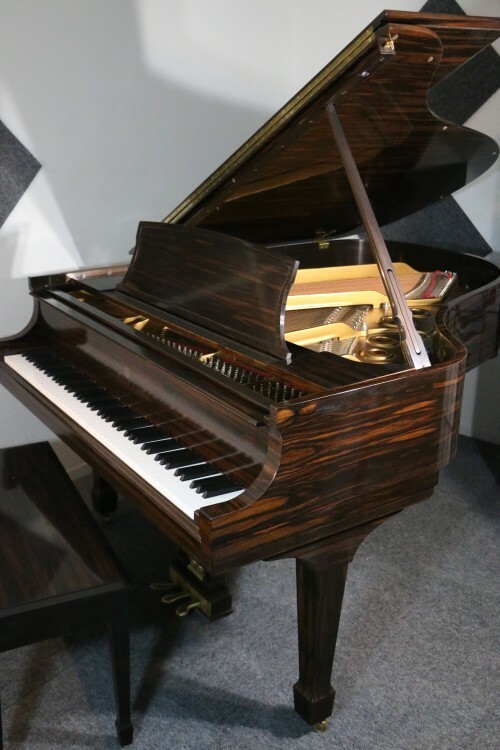 “This very rare precious wood from Sulawesi has a fascinating texture with a deep black colour and a reddish-brown that pulses with breathtaking power..The Steinway Crown Jewel collection is an exclusive series of spectacular grand and upright pianos that feature particularly fine veneers. The veneers are meticulously put together with great artistic skill by Steinway experts. Each instrument is therefore a precious and unique masterpiece.